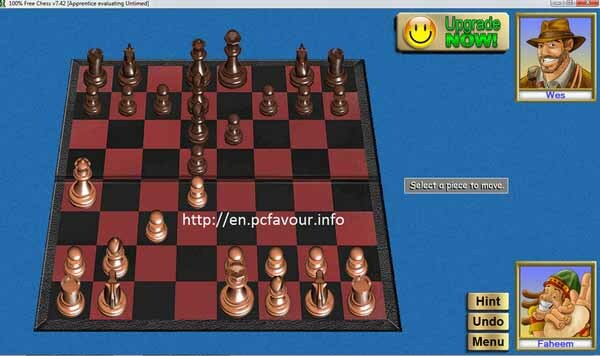 Download 100% Free Chess for PC. It is computer board game. This game is really free for you to play. 100% Free Chess is very light weight to download and install. The downloadable file size is not more than 143 KB. If you will install 100% Free Chess game on your PC, it will take only 8.1 MB size from your ‘C’ drive. When you will start 100% Free Chess game, you are required to enter your profile name. You can type your own name obviously. Similarly, you can enter your location. This is just a formality to start the game. There is also an option to change your face. If you are playing as beginner, then you cannot change your picture in free game. You can start 100% Free Chess game with tutorial. This tutorial will guide you how to play, which piece you have to move and where to keep it. In this way, you will learn 100% Free Chess game easily. When you will think that you can play now easily then you can start “New Game”. 100% Free Chess main menu will also suggest you some more games which you can get by clicking on it. This will take you to the official website of the game. When you will start “New Game”, you will see your opponent such as “Wes” or any other. You will find a chess board having pieces in two groups. Top group of pieces is related to your opponent while the bottom side group is yours. With your picture and name, you will see 3 tabs; Hint, Undo and Menu. Whenever you click on “Hint”, you will get a suggestion to move your piece from your helper. Undo button will take one movement back you. So, there is a chance to correct your mistake in gameplay of 100% Free Chess.